Miracle 60 Second Lift is a complex blend of peptides, antioxidants, and hydration that ensure a more youthful complexion in an easy to apply, portable solution. As we age, the effects of time and experience become more and more pronounced. Wrinkles and expression lines expose our age and significantly alter our appearance. Fortunately, we can reverse the aged appearance by using powerful tightening and lifting ingredients in a remarkable topical treatment, that offers visually stunning results in an instant. 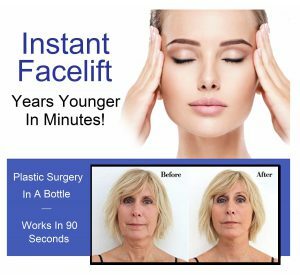 Lasting Looks Clinic has created a miraculous lifting and tightening formula that produces this instantaneous illusion of age reversal. Instantly creates the appearance of tighter, more youthful skin. Helps to tighten and firm areas of concern.